Fukien is a province located on the southeastern coast of China. Fukien currency played a very important role in the history of Chinese numismatics. From the Qing Dynasty down towards the beginning of the Republic, Fukien historical currency is well known for its variety in development and form. 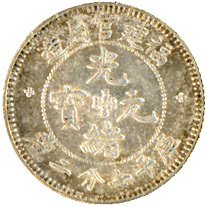 Many valuable specimens were found during the early decades of the twenty century, such as the K'ang Hsi 12-Branches birthday-cash, Chang Chow military silver coins, Hsien Feng big cash with weighing on rim and the Fukien silver dollar etc. I have chosen 2 Fukien silver coins from my collection and posted here. They are not rare coins, but both are in a EF to AU condition with the spectacular colored toning. 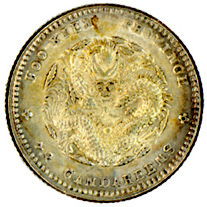 This silver coin was minted in Fukien Province between 1894 to 1900, in 3 different denominations-1 mace and 4.4 candareens, 7.2 candareens, and 3.6 candareens. During that period, there was only Fukien Machinery Bureau or first known as West Branch of Fukien Machinery Bureau existed in Fukien Province. [established in 1890 later known as Copper Branch of Fukien Machinery Bureau]. 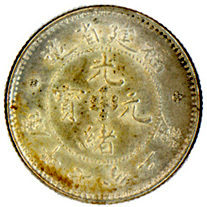 On the center of the obverse are 4 Chinese and 4 Manchu characters mean "Currency of the Kuang-Hsu period" inside beaded circle in centre: in the outer circle, Chinese characters (made in Fukien Province) above, (6 Chinese characters mean Treasury Weight 7.2 candareens) below; small rosettes right and left. 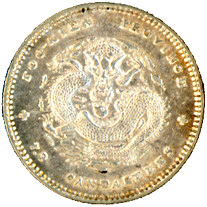 On the reverse is the symbol of the Qing royal family, the dragon. Around the dragon are the words in English "FOO-KIEN PROVINCE" at the head of the dragon and "7.2 CANDAREENS" at the foot of the dragon. The dragon pattern is different from the above coin. This pattern actually was a new design with 4 flames on the fireball, and several editions owing to variations in the designs of the dragon.